This is the 40 Days of fasting for Christians leading up to Easter. 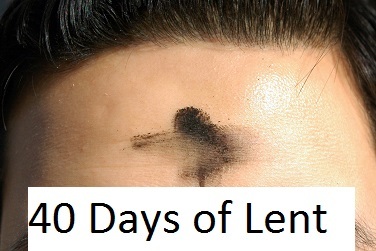 Lent Starts this year on Wednesday, March 1 through Thursday, April 13. The period of the 40 days leading to Easter. This is the Christian Holy Season and so fasting along with prayer during this time will give us all clarity for the season. Why do we need to do fasting and prayer during this season? (Matthew 6:5-7,18-18) “When you pray, don’t be like the hypocrites who love to pray publicly on street corners and in the synagogues where everyone can see them. I tell you the truth, that is all the reward they will ever get. But when you pray, go away by yourself, shut the door behind you, and pray to your Father in private. Then your Father, who sees everything, will reward you. “When you pray, don’t babble on and on as people of other religions do. They think their prayers are answered merely by repeating their words again and again. And when you fast, don’t make it obvious, as the hypocrites do, for they try to look miserable and disheveled so people will admire them for their fasting. I tell you the truth, that is the only reward they will ever get. But when you fast, comb your hair and wash your face. Then no one will notice that you are fasting, except your Father, who knows what you do in private. And your Father, who sees everything, will reward you. It says when you pray and when you fast. Not if, but when. So we see that this is something we need to do. Think about how powerful it would be if the entire body of Christ were fasting all at the same time. Catholics mostly observe lent but I would encourage you if you are in a different denomination to seriously consider fasting during this period as well. The body of Christ needs to do this more than ever right now. Give up something during this season and watch the power of God be released unto you, your family, your city and your nation. Father God, we thank you for this time to humble ourselves before you and prepare our hearts for passion week. We pray that as the body of Christ we will be unified during this time. We bind up the spirit of division and loose unity. The unity of the spirit and the bond of peace. We know that you love when brothers dwell in unity and that your presence dwells there and your anointing flows. We unite our hearts in you Christ Jesus and we ask you to reveal yourself to us during these 40 days so that we may get into a closer relationship with You. At the end of this season we pray that we will be changed. Going from glory to glory and be fully ready and equipped to do your work. Thank you for your sacrifice and most of all thank you for the miracle of eternal life through Christ Jesus, Amen! Join us every day during the lenten season to get daily bible verses and a daily lenten prayer These prayers will be following a theme leading up to Easter and the Easter prayers.